When you buy private proxy, you want to use them to surf the web, watch movies, buy sneakers, scrape websites for data, or do anything else without any problems. Unfortunately, you might engage in some activity that will stick out to search engines and website providers. These activities could actually cause your proxies to get banned. While Blazing SEO lets you exchange banned proxies for free, you would still rather not get your proxies banned in the first place. That way, you won’t have to worry about pausing your internet session to exchange your IP addresses for fresh ones that aren’t banned. Fortunately, there are some tips you can follow to prevent your proxies from getting banned. While you might still bump up against an overzealous censor and end up with a banned proxy from time to time, you will have a lot more success if you follow these tips. That way, you can surf the web with blazing fast speed. A lot of people who use proxies also use bots, and there’s a good chance that you’re one of them. There are a lot of legitimate reasons to use bots online. For instance, you might use them for SEO purposes. Deploying bots to gather SEO information is a great way to get ahead with an online business. You might not just do it for your own company, either. You might gather SEO information for other companies, as well. You can scrape information for a lot of companies at one time using bots. You also might use bots to buy sneakers or to conduct other business online. With so many options, there is a good chance that you use one or more bots with your private proxies. Bots get a bad rap online, but in most cases, they are completely harmless, and websites and search engines don’t even care that they’re there. They even have their own bots that they use. How do you think that Google crawls sites? It deploys its own bots, and then the bots bring back the information. See, Google isn’t anti-bot after all. Unfortunately, there are some bots out there that do some really bad things, and these are the bots that Google and websites look out for. These bots try to do things quickly so they can take action before they are caught. Because of that, they send a lot of requests in a short period of time. For instance, they might try to make it past a website’s login screen by sending tons of requests in a second. All of those requests tip the site off that something is going on. You might have a completely legitimate bot, but if you don’t put a limit on your rate requests, you could be sending websites the wrong message. With that in mind, set up a rate request limit for all of the bots that you use. That way, you won’t send up a red flag every time you make a request to a website. You will look just like any other site user, which is exactly what you want to do when you use a bot. This goes back to using a bot. If you’re using a bot to scrape data on Google, Amazon, Craigslist, or any other site, you have to be smart, especially if you’re sending out a lot of queries. Again, these sites aren’t anti-bot, but they’re on the lookout for malicious behavior. Because of that, they will often block someone who is on the up-and-up, just because that person is obviously using a bot. The key, then, is to mask the fact that you’re using a bot. You can do that pretty easily when you make sure that your referrer source looks natural. Your referrer source refers to the source that sends the traffic to the website. For example, let’s say that you’re scraping Amazon for information. Amazon lists various products on its site, and each product has a unique URL. You could have your referrer traffic come from Amazon itself, or you could go to each URL directly. You could also have all of the referrer traffic come from your website. Now, let’s think about how it would look to Amazon if a bunch of requests came in from direct product pages or from your website. If they came in quickly, it would look like a bot attack and Amazon would shut them down. On the other hand, if the requests all came in from Amazon, it would look natural and Amazon wouldn’t give it a second thought. You would be able to do your business and scrape the site without any problems. This is just one example. The same is true for any website that you scrape or use. You need to make sure that the referral traffic looks natural. If you have to type in a long search string to get somewhere, that is not natural. It’s OK to do it once or twice, but if you’re going to do it hundreds of times, it will stick out, and the website will catch it. Lots of bots get blocked that way, and lots of private proxies get banned. If you want your proxy to keep running, avoid making this rookie mistake. It’s an easy one to make, but it’s also an easy one to avoid. Avoid it so your proxy will stay up and running, even when other ones get banned. The location is important when you’re using proxies. This is a reason that a lot of proxies get banned. A lot of people try to get a deal on proxies by picking some from unpopular locations. They might pick up some proxies from Nigeria or other locations around the globe, without realizing that there is a reason that these proxies aren’t quite as popular. They are more likely to get banned from search engines and websites. It all comes down to the law of averages. Site owners know that more fraudulent activity comes from these locations, so they keep an eye on web traffic that comes from these areas. If they detect anything that seems strange from these areas, they are more likely to shut it down. While you might be able to get away with some bot activity if your proxy is coming out of New York, the same isn’t true if you’re coming out of Nigeria. It is a good idea to stick with popular geolocations. If you dive into high-risk locations, there is a good chance that one if not all of your proxies will get banned. There’s another problem, as well. These proxies are often slower, too so even if your proxies work, you will likely have to wait forever for a website to load. That can be incredibly frustrating. It can also prevent you from taking care of business online. You need everything to work at a certain speed, and if it doesn’t, your proxy is basically useless. 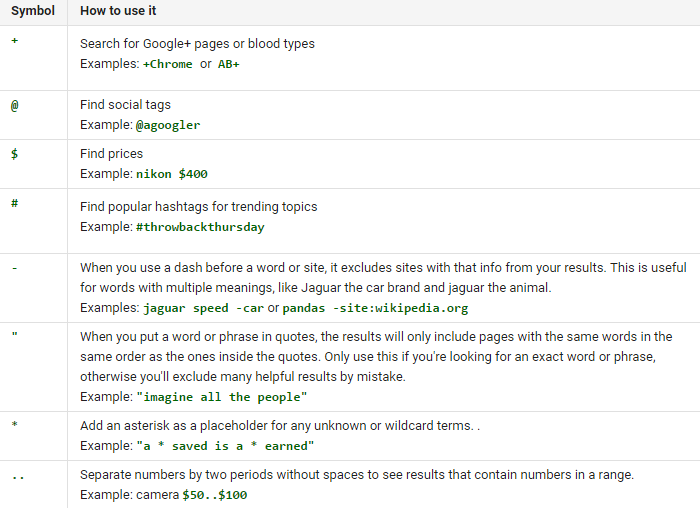 Google search operators can be really helpful to use. Search operators are a list of punctuation and symbols that you can use to get specific search results. As enticing as the search operators might be, they can derail a well-thought-out scraping plan faster than anything else. For some reason, Google pays more attention to searches that include search operators. That means that if you run a bulk search with these operators, Google is more likely to flag your proxies. It will notice that you’re using bots, and it will flag you. In some cases, there might not be any way to get around using search operators. You might absolutely need the information that you can receive from using them. If that is the case, you need to be very careful about how you proceed. Use a limited number of bots, and get your information slowly. If you hit the search operators too hard, you will likely get banned. Also, cycle through your proxies, if possible. Rotating your proxies out when you use search operators will help you avoid getting banned. Again, if you’re using bots, there is a good chance that your proxies will get banned if you do something that makes it easy for the servers to detect your bot usage. If you try to speed up the data collection process, you will make it easy for websites to spot your bots. That means your proxies will be banned quickly. For instance, let’s say that you have a handful of proxies and a handful of bots. You assign a different bot to each proxy that you have. Your plan is to send the proxies and bots out to collect data. You’ll send them all out at the same time to get the data, and then they’ll bring it back to you. By sending them all out at once, you’ll get the data back quickly and then you can use it to your liking. Here’s the problem, though. Even though you’re using different proxies and different bots, your requests will be similar enough that they’ll stand out to the websites. The sites will immediately realize that you’re using bots, and they will ban your entire list of proxies. Then, you’ll have to start over from the beginning. You can avoid this problem all together by staggering your requests. In the online world, this is referred to as running your requests asynchronously. That’s just a fancy way of saying that you need to put a minimum of 1 second in between each request. In other words, you’ll send the bot for one proxy out, and then one second later, the bot for the next proxy will go out. Then, you’ll send the next bot and proxy out a second or so later and so on. You’ll continue this process until all of the bots and proxies are out. If you just stagger your requests, it won’t be enough, but when you do this along with adding rate limits, you are able to trick the machines that detect patterns. You have to remember that you aren’t trying to trick a person. There isn’t a person who analyzes requests and determines if they look strange. There is a piece of software that is coded to look for patterns, and if you can mix the patterns up enough, you can get through the program without any problem. This is just one more piece of the puzzle that will help you get through the pattern so you USA proxies won’t be banned. If you add enough pieces of the puzzle together, you can move through the programs with ease. Some proxy providers have lots of IP addresses but only a few subnets to handle all of these addresses. While that allows them to serve a lot of people at once, it hurts their customers. Websites often ban proxies when they notice that there are many IP addresses on a single subnet. They shut the proxies down without warning, so you might be up and running one minute and then shut down the next. Avoid this problem by going with a company like Blazing SEO. With over 500 Class C subnets, along with a mixture of Class B and Class A subnets, you don’t have to worry about crowded subnets causing you to get kicked off your favorite site. The IP addresses are spread out evenly over the subnets, so your proxy won’t get banned for this reason when you choose Blazing SEO. If you follow the rules and use these tips, you shouldn’t have a problem with your private proxies getting banned. If, for some reason, they do get banned, though, you can switch them out with Blazing SEO. Then, you’ll have a fresh set of proxies to use to surf the web or scrape information. That way, nothing can hold you back online.